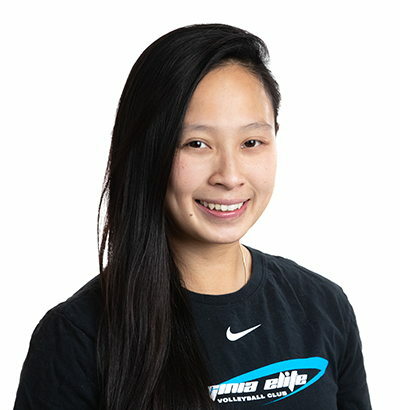 Christine Tran enters her fifth season with Virginia Elite as a 17’s assistant coach after playing and coaching competitively for over 11 years. She was previously the head coach of several 14’s and 16’s teams at both VA Juniors and Fredricksburg Juniors Volleyball Clubs. Most recently, she assisted Head Coaches Jason Kozak and Joseph Ziegler on Virginia Elite’s 15’s and 16’s teams. Tran also helps to coach Elite’s off-season clinics, where she specializes in training passing and defense. A northern Virginia native, Tran played for four years at local clubs and at Oakton High School and before moving on to play collegiately for the University of Mary Washington. While at Mary Washington, she served as the starting libero and team captain in her senior year, consistently leading the team in digs. She remains active as a player in competitive adult leagues. Tran earned a B.S. in Biology from the University of Mary Washington. She currently resides in Chantilly, V.A. and works as an IT Lead for SAIC.